Hello, and welcome to All Your Monies, where The Glorio Blog’s resident toy and figure collecting crew (and Aquagaze) will run down the last week’s new pre-orders, turning a loving or scathing eye over what’s been put out for you to spend your hard earned cash on. This week, beware! NSFW stuff lurks below. Zigg: This is really ‘busy’, which I normally dislike but somehow works here. It helps that the pose isn’t overly sexualised as maid figures often are, and the sheer amount of laces, frills and various accoutrements on top of the basic dress lend it a sort of tacky style. I’ve got a few reservations about FREEing’s ability to deliver the fine quality necessary for a complex like this, and the price hurts a bit, but overall not bad at all. Timmy: I am actually kind of digging this. Akiho certainly has a few issues but the concept is rock solid. Nice hair, cute and confident face, and a fun outfit with lots of little details. There are some weird seam issues on the prototype around her chest and midsection that I hope they fix, and her price is a bit on the high side, but otherwise she is a fairly solid figure in my eyes. 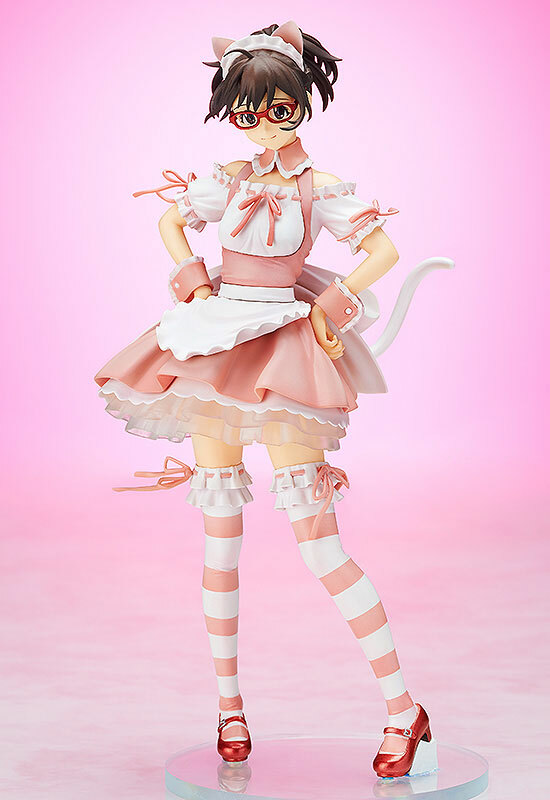 Lifesong: The best thing Robotics;Notes gave us was AR nekomimi megane maid cosplay. Somehow this is the most iconic image I have for the show. Akiho is looking good here and as long as we don’t nitpick there isn’t much of a reason to avoid this figure if you like the character and her anime or game. That said, she costs enough that I am going to nitpick. The seams around her waist and bust look unnatural, her apron looks awkward as a result. She looks great from the socks down and from the neck up, the glossy shoes are a nice touch. She also looks great from behind without the nasty seams to be distracting. Overall I think this is a decent figure, but at 9k yen I want something closer to perfection. Euri: I’ll be honest, it took me a while to work out who this was, as I forgot that AR scene from the beginning of the anime. That aside, while I’d prefer a much more boring, normal version of her, it’s not at all a bad figure of the leading lady. It certainly stands out and you could do a lot worse in terms of revealing outfits, so the only real downside for me is the price. To be honest, if you’re interested in this figure in the first place, you’re probably going to be prepared to pay for it. Zigg: I’ve never liked Madoka’s pink yukata as much as the incredibly striking blue version that’s also been made )albeit as an exclusive). One yukata version of a character is indulgent but two just seems like pure overkill. Timmy: The Madoka train keeps on a rollin’ and while I think most of us are all pretty fatigued at this point, I gotta admit that Madoka here is still pretty adorable. Kyube pouch is also a nice touch, though it’s the only notable accessory. 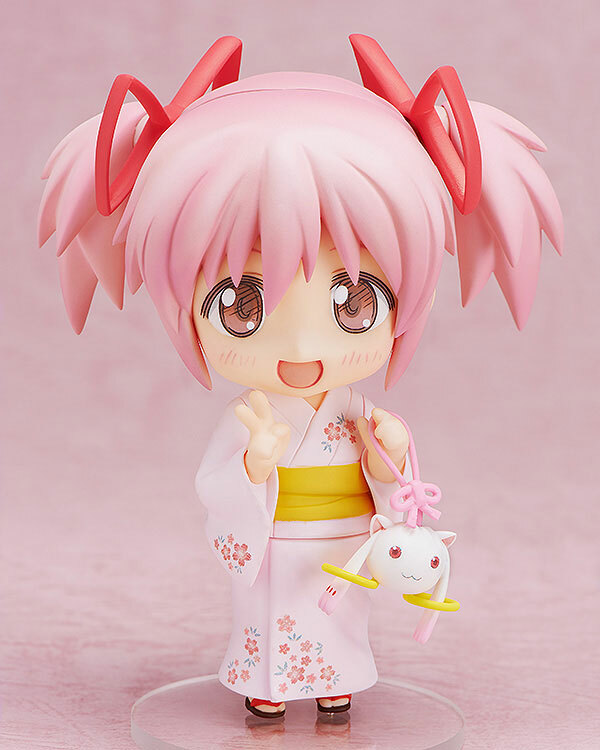 Not a too bad of deal though, even if you are simply after that yukata body that would not doubt look good with any pink haired nendo. Lifesong: Aren’t we done with Madoka yet? I have a soft spot for pink hair, but I’m just so tired of Madoka. She looks cute, I am just entirely uninterested at this point. FREEing should hurry up with Yukata Sonico. Then I can gush about all the things I’m tired of seeing on Madoka. 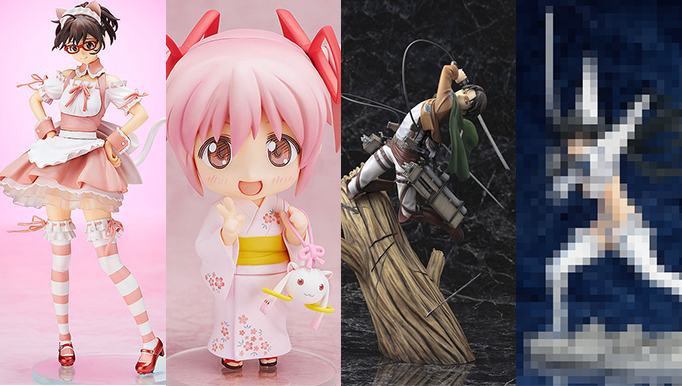 Euri: I picked up the school uniform version of the Madoka nendoroid when I was at the 2011 Summer Wonder Festival. Three years later, and we’re still getting new figures, and we’ve really only had new content in the way of the third film. Honestly, I think only Attack on Titan is showing it up in terms of sheer quantity. And you know what? I’m a chump and would probably buy this anyway, just because it’s adorable. Zigg: I know there’s increasingly little to say about Attack On Titan figures, but I keep including these Kotobukiya ones because they’re jsut so good. Plus it’s always ncie to see some super sharp male figures. Timmy: I don’t really feel like repeating myself. Lifesong: The craftsmanship is as impressive as I would expect at this point. I can even sense some sadistic emotion from Levi which is a real plus as most of figures make him look bored. I like the blades in stuck in the tree base. It gives this figure a harsher edge that no doubt fits Levi better than it would the rest of the cast. At the very least it gives the figure an extra touch of personality that it wouldn’t have otherwise. Euri: Just spent a good few minutes wondering why this was here, as we spoke about it weeks ago. Hey Levi, didn’t see you there. Zigg: My god that face. It’s so bad it distracts from how gross the breasts are, which is really saying something. Timmy: Eh, there are some potentially interesting things here but the quality just isn’t quite there. The wings look a little plastically and while I like the color in the hair, the hair sculpt itself feels a little taffyish. Those hair seams on the back of her head look downright terrible. An ok figure for folks who know who this is but I personally see nothing here that catches my attention. Lifesong: Morrigan looks like she came right out of the 90s and well… I guess she did! Her outfit is entirely ridiculous, but for once it’s not a ridiculous that I like. Don’t get me wrong, I can appreciate the original design, I just think this figure captures her charms very well. The colors are off ever so slightly from what the original illustration and that is just killing it for me. Her Stockings are too bright, the skin on her wings is too pink, her hair is the wrong shade of green and her skin is too dark, especially around her face. This figure doesn’t even do a good job of emphasizing her ridiculous proportions. Her original design is lithe and deadly, here she just looks stocky and tired. Ironically she is probably more realistic like this, but I would much prefer she stick to her 90s roots in their entirety, impossible waist, hips and spine included. Euri: The general pose seems okay, but there’s just too many odd things going on. The face looks really off, and her wings look like they’ve been put on incorrectly, as if someone just opened a blind box and jammed the pieces into the wrong sockets. The base looks awful, and really, if you were going to pay nearly 10k yen for your favourite half-naked bat girl, I’m sure you could do better. You might as well commit yourself and get something truly outrageous for your mantelpiece. Zigg: It’s a solid figure with some nice detailing, But while Ryuko’s action packed pose largely hid how ridiculous her outfit was, there’s not really anything you can do to hide the fact that Satsuki is essentially wearing a hankie over her lady parts. That and the face is curiously off – it’s nowhere near as angry and frowny as it should be. Missed opportunity. Timmy: I really liked Ryuko enough to grab her but the same can’t be said about Satsuki here. From a technical standpoint everything seems fine but she is just showing off too much skin for my taste and the pose puts all of it front and center unlike her Senketsu-clad companion. Not really interested in grabbing her myself but if you are she is at least priced pretty fairly. 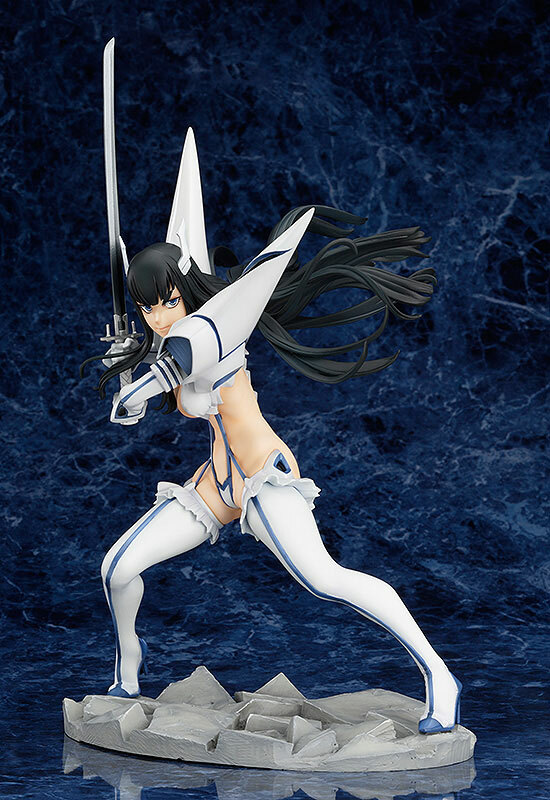 Lifesong: From behind this figure looks like a wonderful representation of Satsuki. Then you see her face and just… no. She looks so disinterested that I can’t possibly buy into this figure. Where is the fierce, ready to take on the whole world Satsuki I remember from the anime? Not here clearly. Euri: It’s the face that ruins this one, unfortunately, as it looks like they’ve just pasted on a sub-par Deviant Art picture. I’m not much of a fan of the get-up and stance, but let’s face it, if you want a Satsuki figure you’re only going to have two choices. If I was feeling picky I’d also like to see a stand that isn’t just a mass of grey cubes, but at least it’s not a perfect disc with a Kill la Kill logo on it or something. I think we can do better than this. Satsuki Kiryuuin Kamui Junketsu version looks pretty nice. I haven’t see Kill La Kill but don’t think want to but this figure makes me re-think that but still not going to watch since feel the animation is too not to my liking. 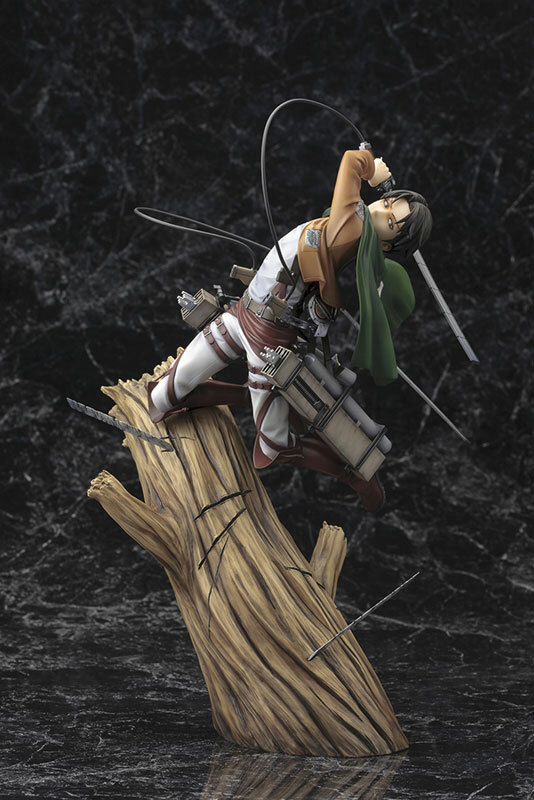 ARTFX J Levi figure looks incredible but then again most of the Attack on Titan figures all look wonderful. love the levi one. besides, them kotobukiya ones always look real nice. dat morrigan though, fml. too much pink and dafuq is up with her face, wish they gave her more of a ds3/vampire savior look, dunno if they’ll do more darkstalkers figure in the future, buuuut hsien-ko figure when?? ?